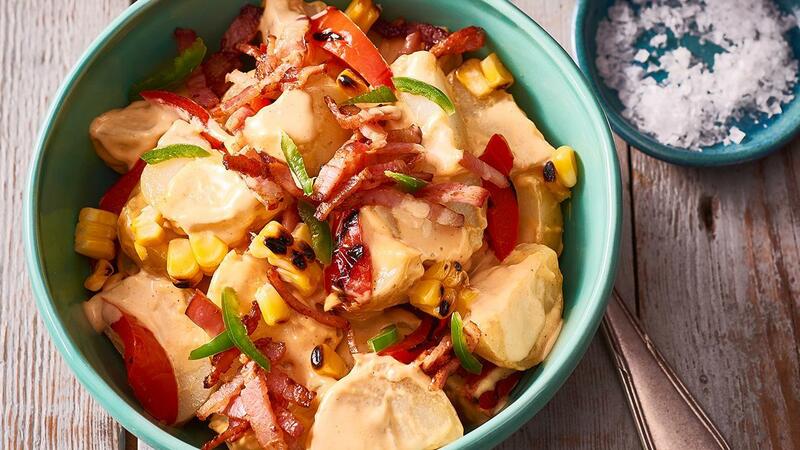 The addition of char grilled corn and jalapenos give this potato salad a nice kick. The dressing combination of mayonnaise, cream cheese and paprika will make sure this potato salad stands out to your customers. Steam potato until tender, halve. Char grill corn. Remove corn kernels. Combine KNORR Paprika Puree, HELLMANN'S Mayonnaise and cream cheese. Place all ingredients in a bowl, pour over dressing, tossing to combine. Use a potato high in moisture so when it cools down it has a good texture.